If your child is really excited about seaweed after our session last week, then you might like to take part in the Big Seaweed Search during the summer holidays. Click here for details. If you would like details on upcoming marine conservation events, please check out the marine conservation page of La Societe. We were really lucky this morning when Mrs Herschel who is a marine ecologist came to talk to us about seaweed. Both children and staff learnt a lot. Did you know that seaweed can be used as suncream, or that it is an ingredient in ice cream, ketchup and toothpaste? We also learnt that seaweed is more important to the world ecosystem than trees! 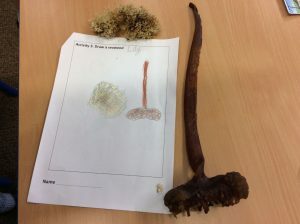 The children got to explore lots of different types of seaweed, were able to wash their hands with seaweed soap, taste different types of seaweed food and draw and label the different parts of the seaweed. 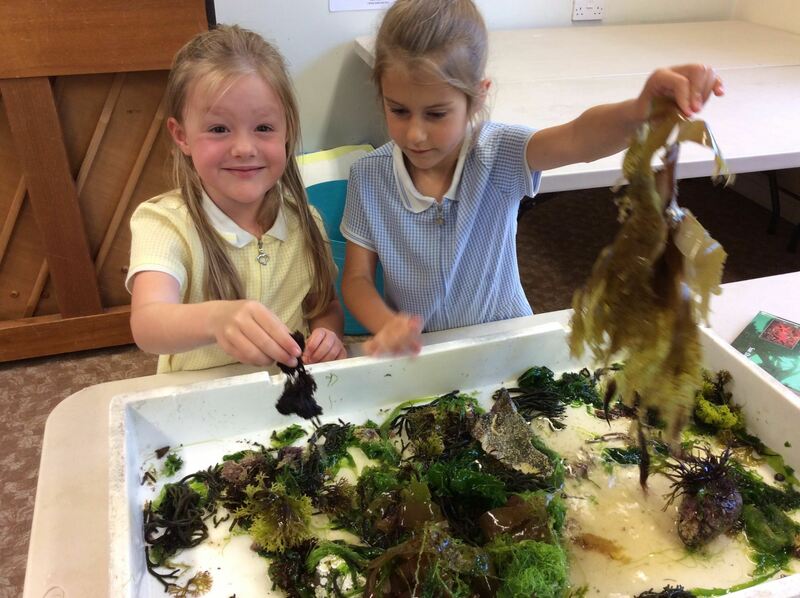 Some children chose to carry on their learning in the Discovery Zone afterwards where they made some seaweed and wrote stories about seaweed. We would like to say a huge thank you to Mrs Herschel for taking the time to come in and share her expertise with us. Next week is our final week of term! You will receive your child’s school report in an envelope sent home on Monday afternoon. In the envelope will also be a Welcome to Year 2 booklet and card with a photo of your child with their new Year 2 class. Please could all children bring a named carrier bag into school on Monday ready for when we start to send work home later in the week. Please note that some pieces of Captain Cook art work will be kept in school as we are putting up a display in the foyer for September. Work will be returned to the children later in the term. Please have a good hunt around home this weekend and return all banded reading books and any outstanding library books to school on Monday. 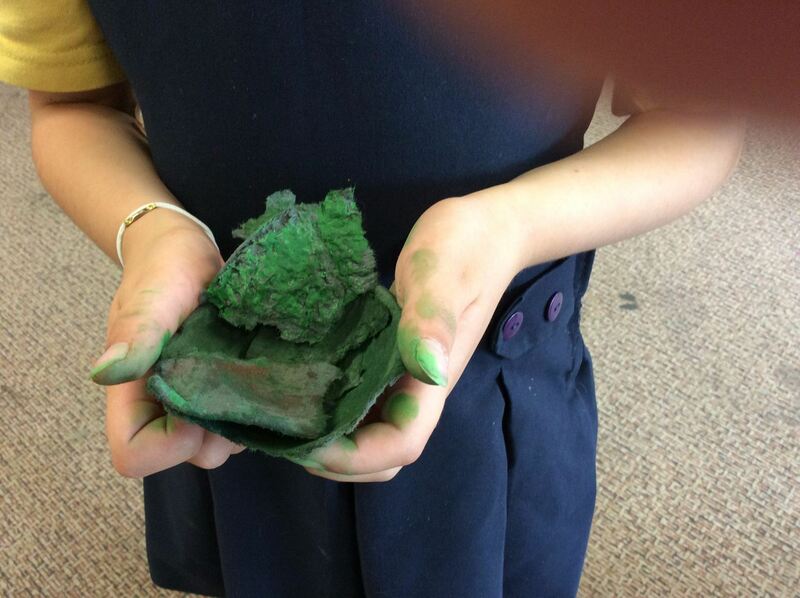 No new books will be sent home next week. School finishes at 1pm on Friday 21st July. Children do not need to bring lunch on this day but may bring a second snack e.g. a bag of crisps, sausage roll or biscuits in addition to their normal fruit snack. In maths next week we will be doing some work on shape, space and measure including telling the time, giving directions and looking at shape patterns. Our work on time includes days of the week, months of the year and seasons. Some of the children found ordering the days and months quite difficult. It would be helpful for your child if you could work on these at home eg. talking to your child on a regular basis about what day it is today – What activities do they do on this day? What day was it yesterday? What day will it be tomorrow? etc. Which month is their birthday? Which month is Christmas in? How many months is it until Christmas/their birthday? etc. In our literacy and topic work we will be finishing off the adventures of Captain Cook as we learn about his final 2 voyages to Antarctica and Hawaii. 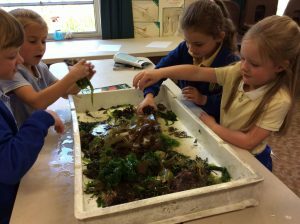 On Friday morning the children will be taking part in a seaweed workshop which will be led by Mrs Herschel who is a marine biologist. The PTA infant disco is on Friday 14th July from 4.45-6pm. Tickets cost £3 are on sale from the office before and after school from Monday 10th July.